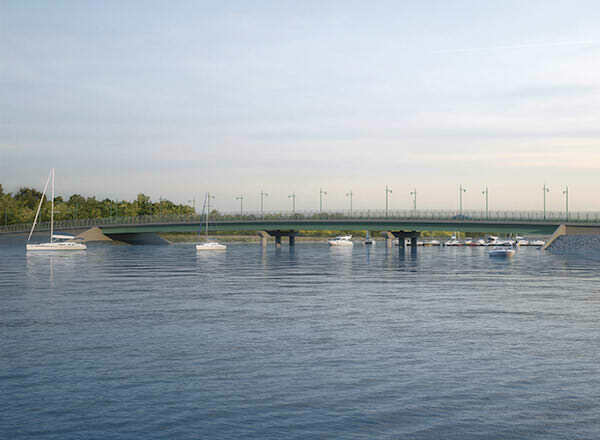 Rendering of the new causeway design of City Island Bridge. Image credit: DOT. New causeway design for City Island Bridge applauded by community and local elected officials. On May 21, 2014, the City Planning Commission unanimously approved an application by the New York City Department of Transportation and Department of Parks and Recreation for a city map amendment to facilitate the construction of a new City Island Bridge in the Bronx. City Island Bridge, which connects City Island to Rodman’s Neck, was built in 1901 and was determined in 2002 to be in a state of serious deterioration. The new bridge would be located in the same footprint as the existing bridge, but will now be approximately 68 feet wide, 17 feet wider than the existing bridge. The wider bridge would allow three standard-width traffic lanes and two 6-foot wide bicycle lanes with two 7-foot wide pedestrian walkways, one on each side of the bridge. The City Map amendment involves the delineation of a bridge corridor on the portion of Pelham Bay Park, the delineation of a bridge easement over Eastchester Bay, the narrowing by elimination, discontinuance and closing of a portion of City Island Avenue, the establishment of parkland and the adjustment of grades necessitated thereby including authorization for any acquisition or disposition of real property related thereto in Community Board Districts 10 and12, in the Bronx. The City Planning Commission held a public hearing on March 7, 2014. DOT Commissioner Polly Trottenberg testified on behalf of the applicants. She stated, “When I arrived at the DOT, I quickly learned that there was strong political opposition to the City’s proposed cable-stayed design for the 113 year old City Island Bridge.” The DOT previously proposed to replace the deteriorating bridge with a cable-stayed bridge, which was scheduled to be built starting in 2007 with completion in 2010. The project was delayed until 2012 when the city announced it would accept bids. In February 2013, the City selected Tutor Perini as the general contractor for the project. On November 6, 2013, residents who opposed the design of the cable-stayed bridge filed a lawsuit against the City for a temporary injunction, which was granted by a Bronx Supreme Court Judge. In December 2013, the Bronx Supreme Court lifted the injunction and ordered the City to conduct public hearings and follow its Uniform Land Use Review Procedure. On February 25, 2014, Bronx Community Board 10 held a public hearing and on March 20, 24014, voted to disapprove the application 33-0. On February 27, 2014, Bronx Community Board 12 held a hearing and voted 25-0 to recommend disapproval of the application. Bronx Borough President Ruben Diaz Jr. recommended disapproval on April 24, 2014. The community boards and local elected officials raised concerns about the previous cable-stay design of the bridge. The Borough President’s report acknowledged the “low-profile scale and the history of the development” on City Island and the special zoning district, which “forbids any structure on the Island to exceed 35 feet in height. The Borough President was, therefore, concerned about the severe impact of the cable-stay design, which would have risen to nearly 165 feet. Robert Collyer, Chief Bridge Officer of the DOT, stated that the city map amendment would reaffirm a 2006 transfer of parkland approved by Governor George Pataki in 2006, and also transfer the promenade to the Department of Parks and Recreation. The application would also facilitate one permanent easement which would allow the construction of the bridge and three temporary easements, which would allow the DOT to “come off the roadway and bring traffic off the island” and “work on the bulkhead in front of the esplanade that’s privately owned.” Collyer stated that the approval of the City Island Bridge application was urgent because “the existing bridge is in need of relief,” necessitating getting off it as soon as possible. Stacy Gardener, a representative of local City Council Member James Vacca, stated that the Council member was originally opposed to the application, but the cooperation and leadership demonstrated by Commissioner Trottenberg and the DOT led to his support. CPC: City Island Bridge (C 140251 MMX–City map amendment); (C 140252 PQX–Acquisition of Easements)(May 21, 2014).